Zak Bagans Net Worth and salary: Zak Bagans is an American TV series host who has a net worth of $5 million. Zak Bagans has earned his net worth through his hosting of Ghost Adventures, as well as being the lead investigator, executive producer and editor of the show. Born on April 4, 1977, in Washington, DC, Zak Bagans made a name for himself as the lead investigator and host of the American TV series about the paranormal Ghost Adventures. He is also one of the co-founders of the Ghost Adventures Crew (GAC), one of the largest worldwide network of professional paranormal investigators. A former skeptic, Zak's interest in the paranormal was awoken when he came face-to-face with the spirit of a suicidal woman in his apartment building in Trenton, MI, in 2002. Six years later, already a graduate from the film school in MI, he started to produce and host the Ghost Adventures. On the show, Bagans and his fellow hunters, Nick Groff and Aaron Goodwin, investigate locations that are reported to be haunted. Even though Bagans is sometimes criticized about his methods, he claims that he respects afterlife and only wants to ignite a reaction from evil entities. In 2011, Zak Bagans became the host and producer of another paranormal show called Paranormal Challenge on the Travel Channel. He went on to narrate Travel Channel special Ultimate Travel: Legends of the Parks and teamed up with Kelly Crigger to write a book, Dark World: Into the Shadows with the Lead Investigator of the Ghost Adventures Crew. 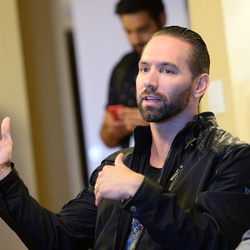 He extended even more his paranormal activities in 2012 as he became the Executive Producer of a new show on the Travel Channel, Paranormal Paparazzi. The same year, he launched his private clothes line called DungeonWear and has been made two music collaborations, one with the Belgian-American band Lords of Acid and other with the Belgian musician Praga Khan.